You can easily merge two or more PDF documents using the best PDF Editor for Mac: PDF Expert. Select the PDF files you want to combine and press Merge. Open a PDF document that you want to combine in PDF Expert. Click on the ‘Thumbnails’ icon on the top toolbar. Select the ‘Append file’ option. Select a PDF file want to add to the existing one and press Add. 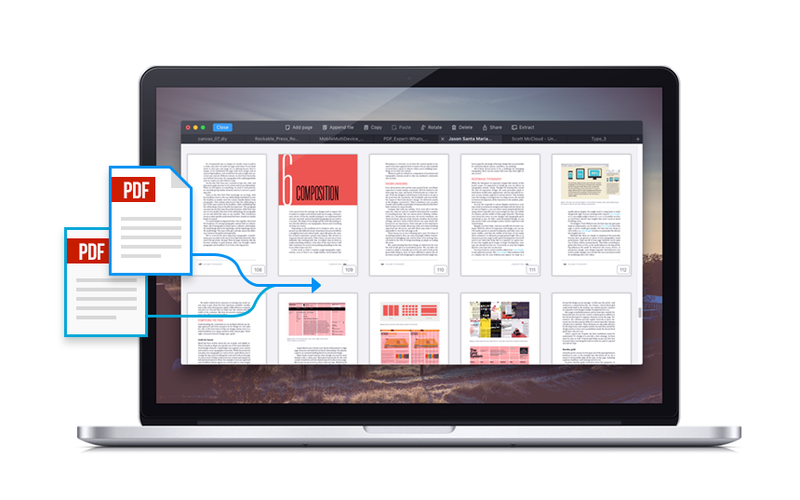 Merging PDF files on Mac is undoubtedly a core tool for any PDF editor. There are several scenarios where you’d want to merge PDF files, such as students wanting to combine multiple assignment PDFs into a single file for submission, lawyers wanting to collate relevant material from different case files into one, or even researchers looking to combine pages from their research into a single PDF file to be published online. Normally, you have to open several documents on your Mac and then copy-paste text and other content from them into a new file created in apps such as Google Docs or Pages. However, when you do that, there is always the risk of losing text formatting styles or images. This can cause some headaches, especially when you edit your content afterwards. Inserting images, changing font, or deleting odd white spaces and entire lines also takes too much time. That is why you need some sort of real & effective merging. There are two basic ways to merge PDFs on Mac: either merge individual pages or merge PDFs into one file. These functions should be intuitive and easy to use. 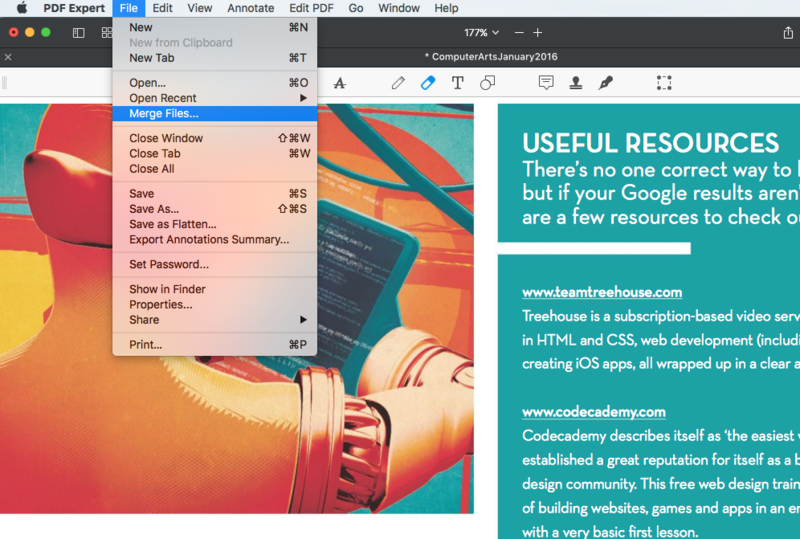 PDF Expert lets you do both those tasks, and also includes an amazing page management toolset. You will be able to add pages from one file to another or merge entire PDFs together without the need to open them. Preview is not intuitive. If it’s your first time trying to use it, you will have a hard time. When you attempt to merge large files, the new one becomes way too bulky. This is when you come across the biggest problem in Preview: It starts working in slow motion, often bringing your system down to a crawl. We’ve described this issue in our previous article. Switch to the ‘Thumbnails’ mode from the toolbar to see a grid of all pages in the current file. Next, simply drag and drop the file you want to merge into your opened document. While in the ‘Thumbnails’ mode, use the special tool “Append file’ to manually pick a PDF file that should be added to your file and then click Add. Merging is usually the very first part of any workflow. After that, you can select multiple pages, and annotate, extract, delete, rotate, share, copy or paste them in the most intuitive ways. 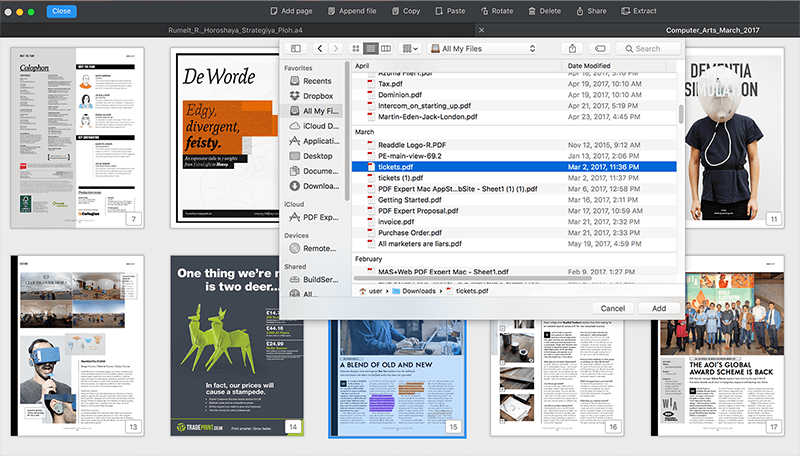 PDF Expert isn’t the only tool for those seeking to merge PDF files on Mac, but it’s really simple, fast and flexible. You are welcome to get a free 7 days trial to check it out. Let us know what you think, and please don’t hesitate to reach out to us for any help.